Dividend payments make a huge difference to the Dow's overall returns. The Dow Jones Industrials (DJINDICES:^DJI) posted a modest 15-point gain today, as investors continued to assess how much more headway the index can make as it once again approaches record levels. Yet with all the attention the Dow gets when it hits a new closing high, one thing that often gets neglected is the fact that dividend payments make up a substantial part of the average's overall return. For Dow components AT&T (NYSE:T), Pfizer (NYSE:PFE), and Intel (NASDAQ:INTC) particularly, dividends have made the difference between subpar results and reasonable returns. 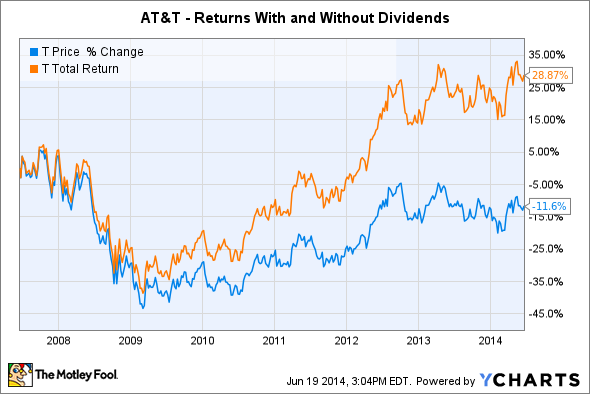 Dividends have always been an essential component of the AT&T's total return. With massive cash flow generated from its wireless network, the telecom giant can plow plenty of capital investment back into expanding and improving its service while also rewarding shareholders with the richest yield in the Dow Jones Industrials. Indeed, over the past seven years since the last time the Dow was hitting new record highs, AT&T's share price has actually declined in value. But when you add in its lucrative dividend yield, AT&T's average annual return amounts to almost 4%. Pfizer has a mixed reputation as a dividend stock, with the pharma company making a big dividend cut when it acquired Wyeth. Even though Pfizer has suffered substantial drops in revenue with the loss of patent protection for some of its best-known medications, the Dow component has still paid reasonable quarterly dividends to shareholders. 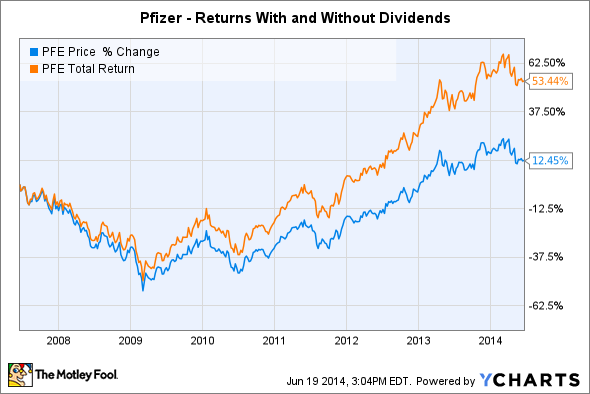 Without dividends, Pfizer's share-price returns over that seven-year time frame would have been limited to less than a 2% annual clip. With them, the stock's average annual return climbs above 6%. 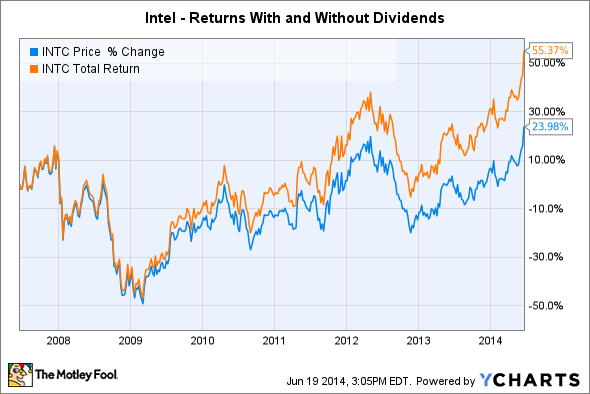 Intel has the distinction of being one of the first technology stocks to emphasize dividends. For much of its history, Intel's payout was merely a token, but dividends have more recently played a greater part in the chip giant's total return. In particular, Intel's share price has lagged behind some of its peers because of the company's challenges in keeping up with changes in mobile technology. Yet when you include the impact of dividends, Intel's roughly 3% annual return doubles to more than 6%. One problem with the Dow Jones Industrials is that the index ignores dividends. But investors should pay close attention to Dow dividends, because they can make a huge difference to your total return.